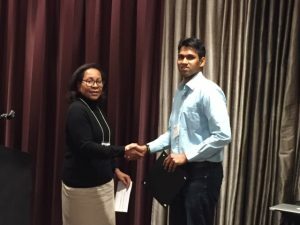 Vamsi Talla (Ph.D. ’16) received the award at the March 21 event in Seattle. Vamsi Talla (Ph.D. ’16) received the 2016 WAGS/UMI Outstanding Innovation in Technology award for his doctoral thesis. His dissertation, entitled “Power, Communication and Sensing Solutions for Energy Constrained Platforms,” investigated the use of specific technologies to achieve ubiquitous computing. The award given by the Western Associations of Graduate Schools (WAGS) and University Microfilms International (UMI) recognizes the innovative application of technology to scholarship in a master’s thesis or dissertation. Talla is currently a postdoctoral researcher with the Paul G. Allen School of Computer Science & Engineering at the UW. He works alongside Associate Professor of Electrical Engineering and Computer Science & Engineering Josh Smith and Assistant Professor of Computer Science and Engineering Shyam Gollakota. His current research focuses on the development of battery-free sensing, computational and communication platforms for Internet of Things and Wearable Devices. Recently, Talla and his colleagues introduced Interscatter communication (or inter-technology backscatter). This novel approach delivers wireless transmissions from one device to the next through the air. This process allows devices such as brain implants, contact lenses, credit cards and smaller wearable electronics to communicate with everyday devices such as smartphones and watches. Talla was honored at the March 21 award lunch in Seattle.